Three roads come together in a saddle east of Saddle Peak. Stunt Road, Schueren Road and Saddle Peak Road all originate at this point. A convenient off-the-road parking area can handle at least a dozen cars, and if we were to organize the parking, maybe twenty. As an aside from hiking, people have been known to drive up here on a quiet night just to look at the lights below. Our hike starts by walking west, slightly downhill on Stunt Road for 200 yards. The Saddle Peak segment of the Backbone Trail angles left leaving Stunt Road and continues to a ridge crossing over to the south side. We continue almost level until we see a large water tank ahead. Go around the tank to follow an uphill trail to a level area and a fork in the trail. We take the right fork to continue on the trail or we can take the left fork and go to the top of Saddle Peak East. At 2800 feet Saddle Peak is the highest point in the eastern or central part of the Santa Monica Mountains. If timed right, a peak climb on a full moon night will not only reward us with magnificent views of the cities' bright lights but also of the moon coming up from the eastern horizon. On top the peak is flat and open. On the sides hundreds of Spanish Broom bushes, some ten feet high, effectively control the erosion. Come here in April, May, June and maybe July for a real treat of sight and smell. The volunteer trail crew of the Sierra Club hosted a Summit dedication at 12 noon on 8 December 1990. To continue the hike we start downhill passing through a stand of Chaparral Pea (in the same family as Spanish Broom) also about 10-feet high and blooms in May. A slab of rock several hundred feet long is on our left until the trail makes a switchback right and threads down through "Gateway Rock." We could stop in the protection of immense boulders in preparation for the downhill stretch ahead of us. a north-south land corridor about 300 yards wide was available for trail use coming down the north side of the slope. We notice it took sixteen switchbacks to stay within the land ownership boundary, but the trail is unique and does get us down the hill. We will have descended about 750 feet from the peak when we level out. From here to joining the Saddle Creek segment, the trail is almost level. We pass a Eucalyptus tree on our right and make a left turn to go west. In ten minutes we intersect the Saddle Creek segment and turn around to return the way we came. If we turn right at the intersection it is 3/8 of a mile to Stunt Road, if we want to walk back to our car along the road. A left turn at the intersection would put us on Saddle Creek segment with 3.2 miles to go to Piuma Road. 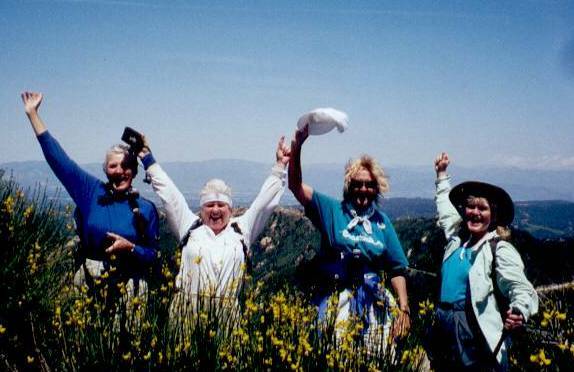 Each Sunday in November the Sierra club leads hikes on the Backbone Trail. Check the schedule for this one. Upon reaching the Saddle Creek segment of the trail we might elect retracing our route back to Saddle Peak. When we reach our cars and want more exercise we might select the trail to the Topanga Lookout Site (although the lookout tower has been taken down). This would add another 3-mile roundtrip. Topanga Ridge divides the Malibu and Topanga watersheds. Today's walk will be at the 2400 foot level, at first below the ridge, then along it to a high point where a lookout tower stood for many years before it was removed in the 1970s. The site is owned by the Mountains Restoration Trust and the access road is privately owned and OK to use. Primarily a Chaparral plant community, the ridge does support some Coastal Sage Scrub plants. A fire swept uphill in 1970 and left only the burned trunks of bushes and trees. Recovery has been complete with only a few burned stumps still visible. This is a walk and is focused on the plants that grow here. Park off the road at the junction of Stunt Road and Saddle Peak roads at the crest of the mountains. The trail is a fireroad leading to the site of the fire lookout. The road is paved for about 500 yards at which point it forks, with the right fork going uphill to a telephone relay tower. Because the road is paved part way and the grade is reasonably gentle, this walk can be used by those in wheelchairs. When the pavement ends the road becomes rough but it is hard ground and rock, but passable. Parents with children in strollers might have a problem because the wheels are small. The first part of the walk is high on the north facing slope of the mountain and although classified as Chaparral, the vegetation includes Bay Trees, Coast Live Oaks, Canyon Sunflower, Heart-leaved Penstemon, and some Grassland plants. Toyon with red berries from November until late winter, Scrub Oak with small but many acorns, Russian Thistles and other small shrubs dominate the first part of the walk. Look for Giant Rye, Hairyleaf Ceanothus, Saw-toothed Goldenbush, Bush Lupine, Phacelia, Cliff Aster, and Honeysuckle. When the trail forks, we go straight ahead onto a hard dirt road. Geologically most of the rock along the route is sandstone and pebble cobble conglomerate. We will see some immense slabs, usually sloping steeply toward the northwest. Several intrusive sills and dikes of volcanic diabase in the form of weathered spheroidal blocks will be seen in the road and in roadcuts. This volcanic diabase is called "Onion Rock" because it exfoliates as it weathers. Some of this will be found in a roadcut after the route reaches a saddle and makes a definite turn toward north. Wand Buckwheat is the dominant plant on the face of the roadcut. Later we will cross an area where the pavement of the road shows the distinctive diabase pattern and we have an opportunity to see it up close as we walk. California Buckwheat, Chaparral Currant, Bush Senecio, Bigberry Manzanita, Two-tone Everlasting, Telegraph Weed, and Laurel Sumac will be seen all along this stretch of the road. The lookout site is surrounded by alien Pine Trees. These rarely reproduce in the Santa Monica Mountains, but once established, some species are able to live many years. The lookout site isn't the neatest spot in the mountains. The broken bottle evidence indicates that the spot has been popular as a rendezvous for beer drinkers and careless picnickers. The road continues around the eastern side of the old lookout, dropping rather steeply. Look for more diabase "Onion Rock" in the roadcut. Bush Poppy, Hollyleaf Cherry, Red Shanks, Hairy-leaved Ceanothus, and Mountain Mahogany are found on the north facing slope alongside the road. Plummer's Baccharis is found in the saddle where we can look into Old Topanga Canyon watershed. The road ends at a sandstone knoll and we can look back to see the large tilted sandstone slabs. A rock scramble trail goes down the ridge northwest from the end of the road, but we won't hike the ridge on this walk and will turnaround to return the way we came.